Now Drupal 8.4 is released, and Drupal 8.5 development is underway, it is a good time to give an update on what is happening with Drupal's Layout Initiative. Traditionally, site builders have used one of two layout solutions in Drupal: Panelizer and Panels. Both are contributed modules outside of Drupal core, and both achieved stable releases in the middle of 2017. Given the popularity of these modules, having stable releases closed a major functionality gap that prevented people from building sites with Drupal 8. The Layout Discovery module added in Drupal 8.3 core has now been marked stable. This module adds a Layout API to core. Both the aforementioned Panelizer and Panels modules have already adopted the new Layout API with their 8.4 release. A unified Layout API in core eliminates fragmentation and encourages collaboration. Today, Drupal's layout management solutions exist as contributed modules. Because creating and building layouts is expected to be out-of-the-box functionality, we're working towards adding layout building capabilities to Drupal core. One of the nice improvements that went in Drupal 8.3 was the Field Layout module, which provides the ability to apply pre-defined layouts to what we call "entity displays". Instead of applying layouts to individual pages, you can apply layouts to types of content regardless of what page they are displayed on. 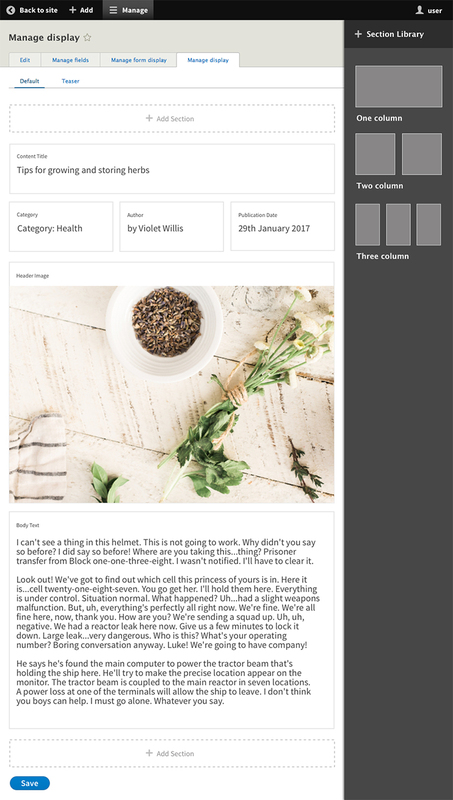 For example, you can create a content type 'Recipe' and visually lay out the different fields that make up a recipe. Because the layout is associated with the recipe rather than with a specific page, recipes will be laid out consistently across your website regardless of what page they are shown on.